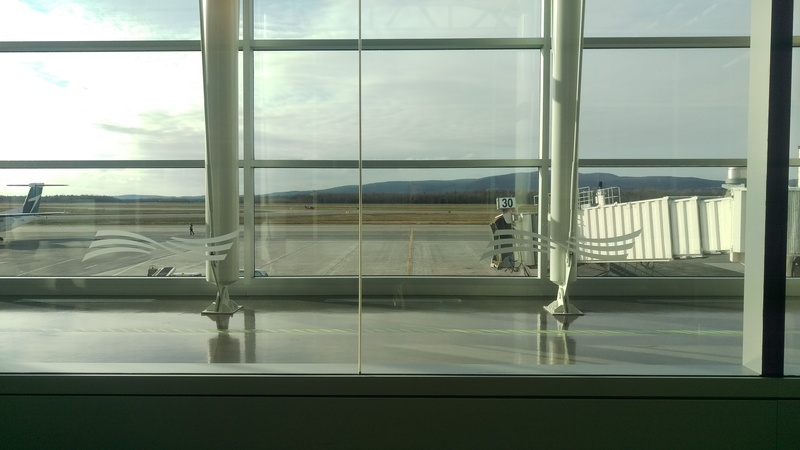 Issue 203 of Solaris, with a translation of a recent Claude Lalumiere story, and a chapbook. Patrick Senecal – Contre Dieu There’s a translation available from Quattro Books. I will want to compare it to ChiZine’s Tom Picirilli book after I’m done, because they sound similar. I then spent a few hours in the local library (Gabrielle Roy), which seems to be the central library with archives and administration. 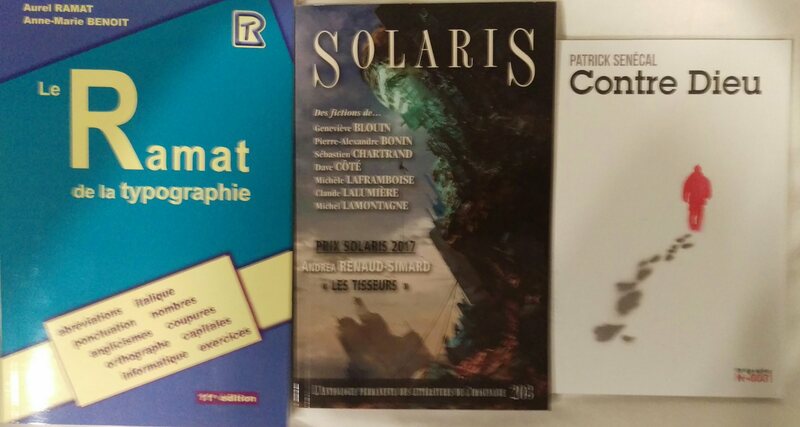 I was able to find a copy of the DALIAF (a biographical dictionary of Quebec SF/F writers) to browse – which is a big deal, because it’s a 50$ PDF (80$ print) and neither the University of Toronto Library, nor the Merrill Collection has a reference copy. I found a few names to check out in future who might fall into the Fantastique/Weird end of things, or are writers of color/ women, but it’s not something I would find use for more than once. That night’s dinner was fish & chips and local cider at brewpub la Korrigane. The next day was brutally cold, which was unfortunate because it was the day we had planned to do lots of walking around and we weren’t dressed for it. We hit up another used bookstore, and this one inexplicably shelved books three rows deep and spine in. 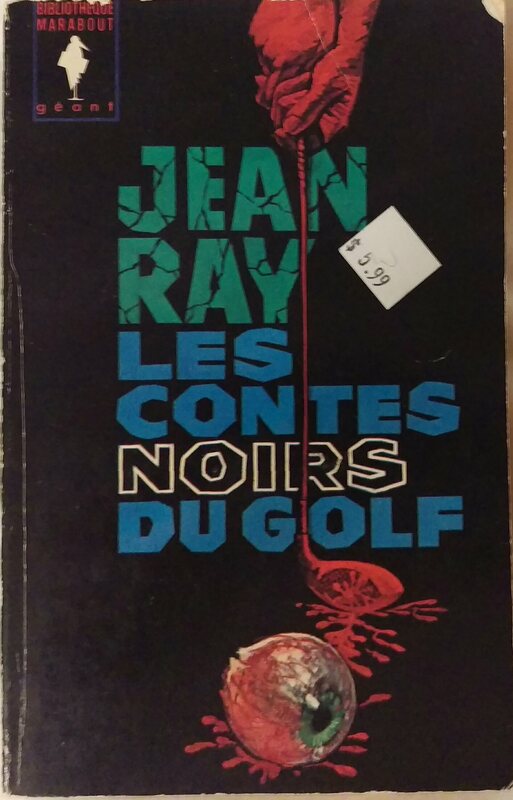 I still found a copy of Jean Ray’s les Contes noirs du golf, because it was cheap and I’d never seen it before. We ended up wandering around the old city and nearly froze our asses off. Nothing else was worth picking up in the bookstores we checked. Mel did get a fancy llama hat, because she hadn’t packed a hat. We also hit up the comics store just inside the wall (which was steps from the hotel where we first stayed a few years ago) and scored a few fun prints by this local artist. Saturday was the busy day, as we made a pilgrimage to the ONE bookstore in Quebec City that sells books by Les Six Brumes. I bought one of everything they had, because it’s just easier that way. Dix ans d’eternite – an anthology of titles that have appeared over 10 years of the Brins d’eternite magazine. Frederic Raymond – Jardin de Chair Though it sounds intense on Goodreads. I found out they’ll be tabling at the Toronto Salon du Livre, so I’ll probably pick up some more (who am I kidding, I asked about ordering stuff for pickup there). After that we hit up the Musee National des Beaux-Arts for the Mitchell/Riopelle exhibit. Totally worth checking out if it tours and you like modern art/ abstract expressionist stuff. 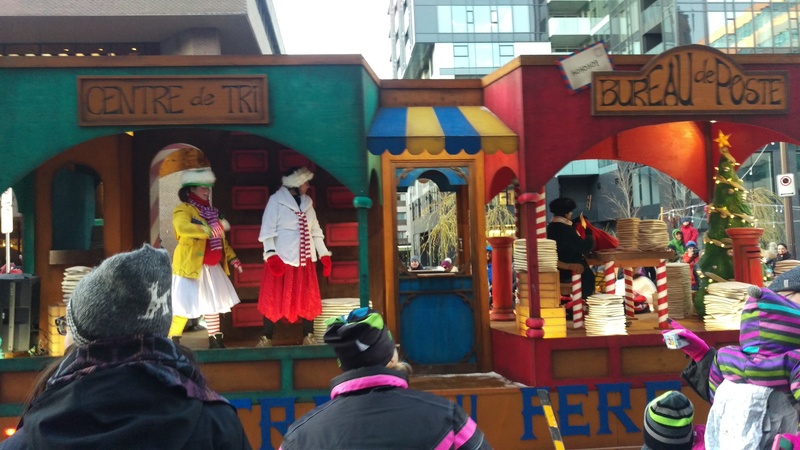 There was also a fun interactive piece. 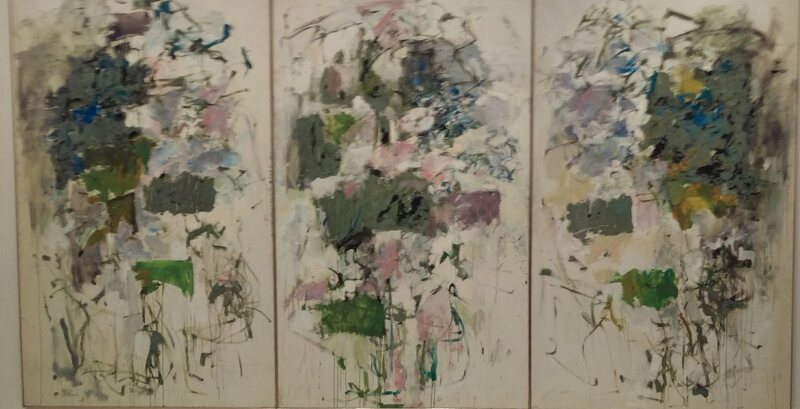 Some of the Joan Mitchell stuff was amazing, and it was really interesting to see how they influenced each other. 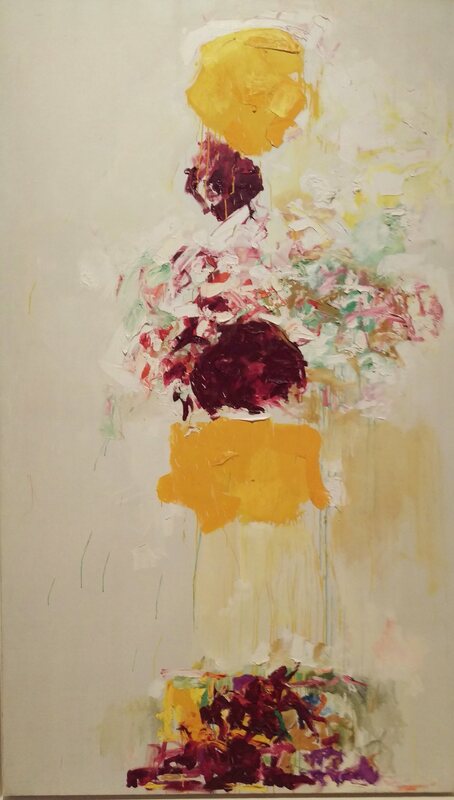 I think I liked her mix of abstract and figurative better than Jean-Paul Riopelle’s. These images are not good examples. 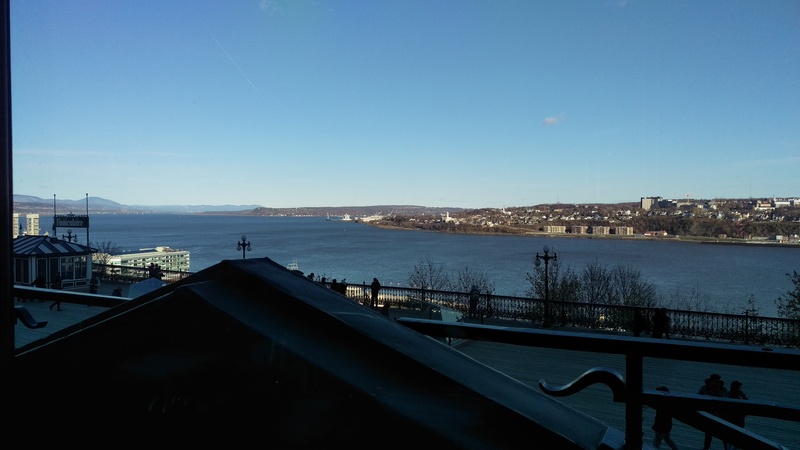 Then we went to the Chateau Frontenac for afternoon tea. They no longer serve their Darjeeling, so my wife was disappointed because it’s her favourite. The dessert was buffet style and I ate too much. We randomly followed a street down to the harbour to check out the market. It was still a farmer’s market and not a gift market like the last time we visited, so we left without any seasonal gifts for young people. The trip home involved stumbling across the equivalent (maybe?) 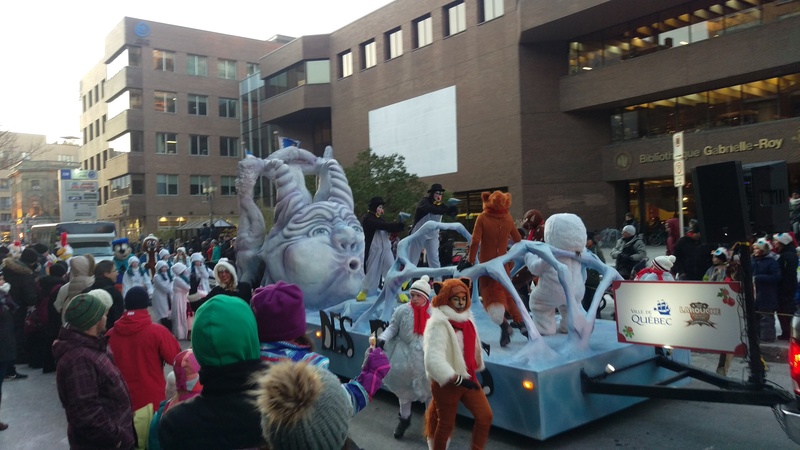 of the Santa Claus parade right at our doorstep. I highly recommend the bus passes. We paid slightly less than 3 trips for them, and took the bus 4 times, avoiding tons of walking (which is fine when you aren’t on a schedule). Out at 930 and back at 430. Sunday was a bit lazy as we cleaned up the apartment to check out at 11. From there we had brunch at Le Clocher Penche, which in addition to good food, had room for our luggage. They also played some good post-punk tuneage. From there it was straight to the airport. My flight was later than Mel’s, and included a stopover in Montreal, so I killed time reading my new books.